wi-tribe in collaboration with Capital Development Authority (CDA), recently organized “walk-a-cause”, an event where employees embarked on a walk to encourage support for the environment. wi-tribers set out together from wi-tribe’s head office in F-8 Markaz to Faisal Mosque, in Islamabad. 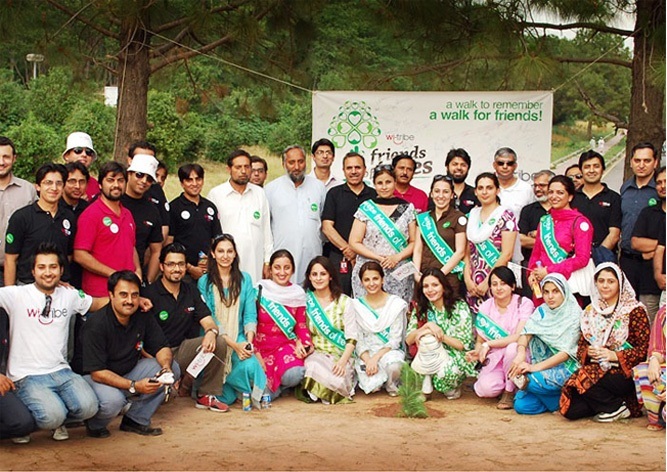 110 Saplings were planted by various members of wi-tribe’s Islamabad team. wi-tribe is an environmentally conscious company that encourages initiatives that give back to nature and have positive effects on the environment. wi-tribe also recently implemented a “paperless environment project” prevalent though out all wi-tribe offices in Pakistan. wi-tribers has always ensured not to neglect its responsibilities to contribute for a greener tomorrow. This is one of many socially responsible initiatives that wi-tribe has taken in the short time since it launched in July 2009.
when’s witribe coming to mulan ? Before such walks and claims they should put their cell towers on solar energy first. tree is life … we should plant them as much as possible. Compare to late 90’s and now Islamabad has changed a lot environmentally.